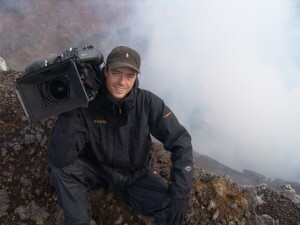 Now based in the United States after his stint in Iraq, Schwetje is director of photography for his own Lars Schwetje Productions, creating video for media companies such as the History Channel, ABC, and NBC, as well as an array of corporate clients. ARD provided the team with the resources needed for the Iraq assignment, including four satellite uplink modems for transmitting stories and for live mobile stand-ups on the road. They carried several cameras and two laptop-editing computers, as well as helmets and bulletproof vests. Schwetje says one border officer stubbornly continued to search, ready to take their car apart. Just then coalition forces flew over the border crossing and everyone scrambled for cover. “In that moment,” he says, “our search was not that important to the police.” In the confusion, they crossed into Baghdad with all of their equipment intact. 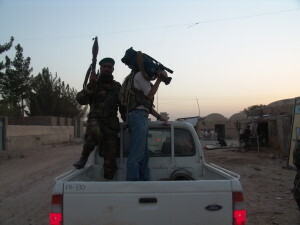 For effective reporting in a war zone a TV station will have to provide logistical organization, such as sorting out satellite feeds to file stories, transportation, and getting the right fixers and translators for the stories. Without that kind of support there are no stories. This attitude – a winning one for any filmmaker or journalist – helps him focus more on filming the story and less on dealing with a changing situation. In war zone environments Schwetje says bonding with your team is critical. You put your life in their hands. Usually, only people who know each other and have worked together on previous productions – producer, cameraman, editor, soundman, satellite tech – team up to report from war zones. Schwetje started out as a photojournalist for newspapers and magazines and transitioned into television producing and production management. Camera operators, directors of photography and producers, he says, usually start out as still photographers. Asked if he thought journalism has changed since he began his career, Schwetje says, “Not really. Journalism is still the same as it was five, 10, or 20 years ago. The real problem is that very few people practice real journalism anymore. He is convinced that media can be very effective in helping reduce violence and avoid the use of arms by informing the people about peaceful solutions to conflicts, as well as helping with nation-building.